In order to promote the utmost standard of hard work and productivity, an office should be clean, organized, and functional. Our office isn’t any of those things. 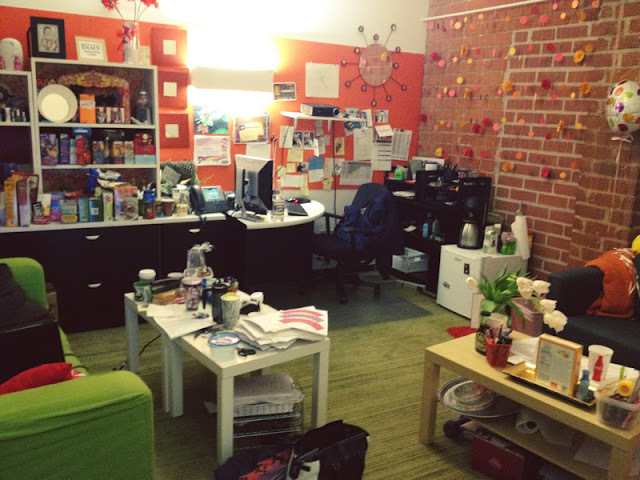 Our office has been described as a spectacle, a college dorm room, and something out of a CW sitcom. It has never been described as “a professional workplace environment” or a “good reflection upon the company”. Usually people see it and say “wowww...” in that long, trailing off way that says they’re both impressed and judging you. And we’re okay with that so long as people know we actually do work. Really. We do. 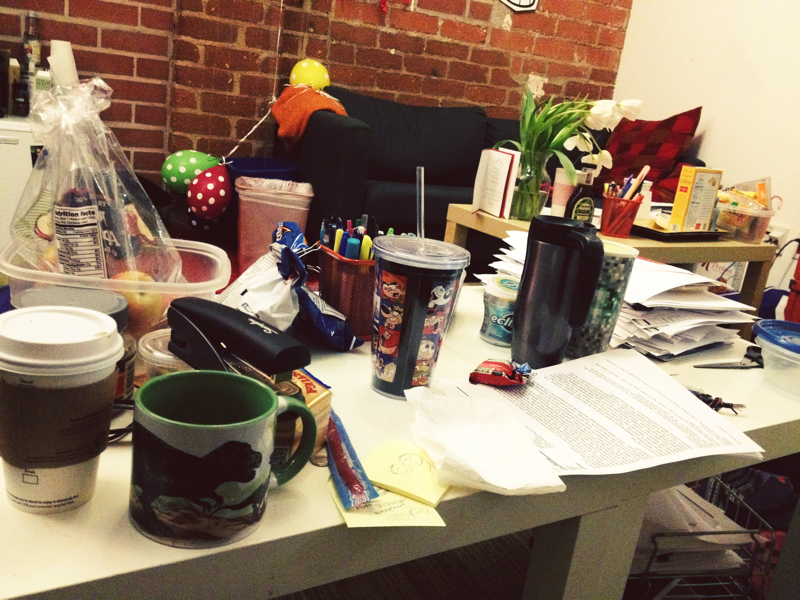 When you walk into our office, the first thing you’ll notice is probably the snacks. We keep our office stocked with snacks. So much so that we might have to throw a small party to get rid of them before we leave. I don’t know how the whole snack thing started - probably with a bag of Pirate Booty and some Oreos to fill our emergency chocolate needs. But as you can see, it has since spiraled out of control. 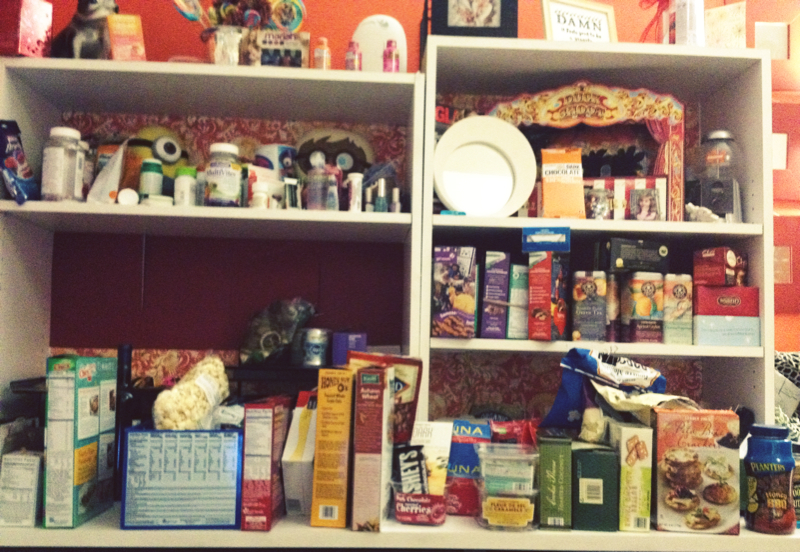 We have everything from popcorn to dry cereal to Girl Scout cookies. People come by looking for snacks and we’re like “YES! PLEASE TAKE SOME.” And then they hang out for a while and chat because they’ve been taken in by our magnetic personalities. Either that, or they feel obligated to be friendly with us because they just ate our food. The next thing you’ll notice is that Joanna and I don’t have desks. We both work on laptops and if we’re writing we project it on the wall, so we didn’t feel the need to have desks. Instead we have couches and super messy coffee tables. How many caffeinated beverages does it take to keep a writer going, you ask? Answer: an unholy amount. You’ll also notice our decorations. I like to describe our aesthetic as: orange. We have a wall o’ stuff that mostly consists of Chris’s artwork, pictures of my dog Ponzu, and random ads I ripped out of a Teen Vogue. Also on display: 2 one dollar bills (we won them from a lottery ticket, so they serve as a constant reminder that we’re winners), Joanna’s certificate of completion for a mandatory sexual harassment test (naturally we laminated that), an empty box of coconut popsicles (that’s a weird one. I’ll give you that). Another thing we have in our office is a Whitney! 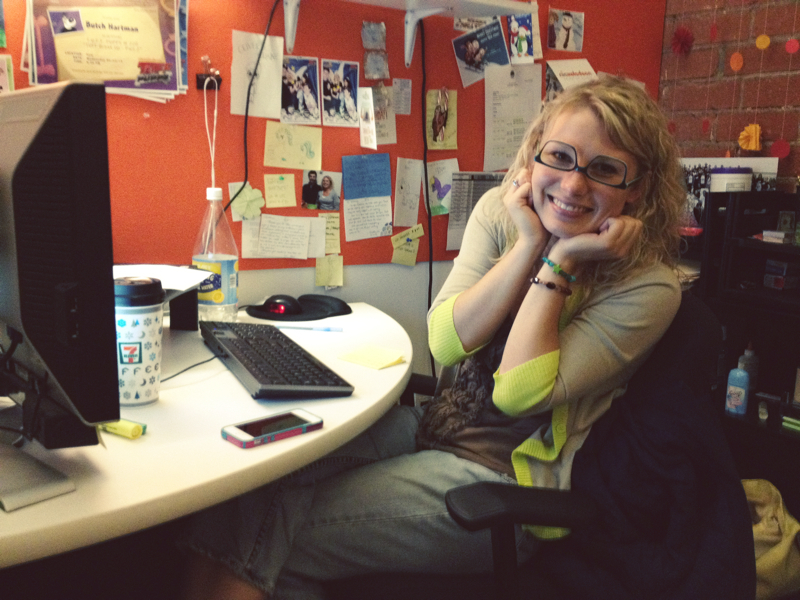 Whitney is our amazing script coordinator whom we love and cherish and yell at a lot. She’s in charge of keeping us in line, typing down (and making sense of) the word vomit we call “jokes”, and bringing sunshine into our hearts just by being there. We could go on and on about the wonder that is Whitney, but we won’t. Because we plan on having a dedicated post on her later. We have a projector that projects onto the wall so we can all see the genius that Whitney is typing. Unfortunately we project onto the same wall as the door so when people walk by it looks like we’re just talking to each other. I can’t tell you how many times we’ve had to convince someone that we’re actually doing work. And how many times we’ve had to close the SNL video we were watching to do just that. That pretty much sums up our office. We like to think it’s become a bit of a Nickelodeon staple in the time we’ve been here. Someone once told us they heard an exec talking about how they liked Nick’s laid back atmosphere and said “there’s an office full of ladies who work from couches!” Yep, that’s us. 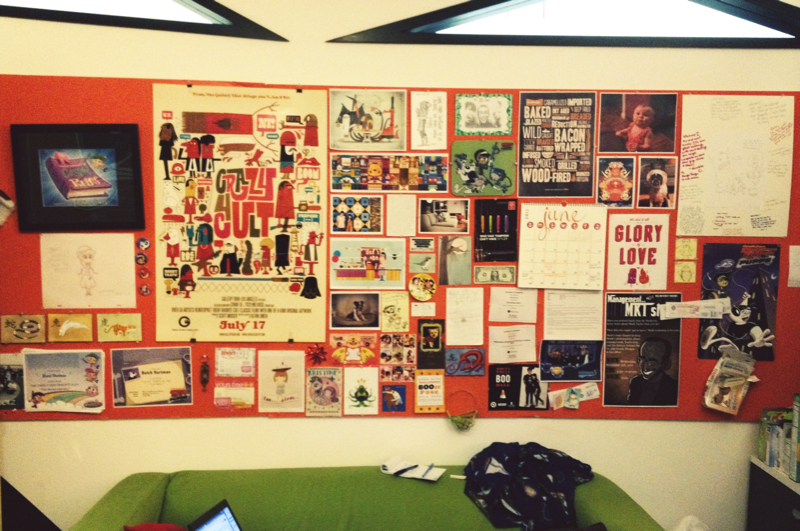 We love our office and the time we’ve spent in it. We will miss it to pieces when we’re gone but at least we have this documentation of it. We shall sear these images into our minds like seared albacore tuna.